This summer we’re keeping it light, with this lovely, laid-back retreat. 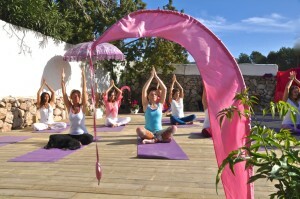 For those seeking a lighter version of our more transformational retreats, this delightful, healthy holiday offers daily revitalising yoga for all levels, treatments & therapies on tap, yet with a more laid-back approach. You’ll have plenty of time to explore the gorgeous White Island and our morning hosts will be on hand to offer advice and guidance to help you make the most of your stay. However, if going out isn’t your thing, this retreat is also a sanctuary for those who want to escape the crowds, preferring to be horizontal with a cool drink and a good book, without pressure or obligation to do anything! Introductory massage as your first taste of relaxation! Afternoons plus 2 evenings free to explore beautiful Ibiza! Optional additional pampering therapies from our hand-picked team of wellness experts. 13.00 – ‘You-time’, siesta, receive treatments, read, sleep, reflect… or go out and explore the island – your choice! 8pm – A delicious, healthy and flavour-packed dinner under the stars on 4 nights / 2 free evenings to go out. Extras: Flights, transfers, any further wellness treatments & therapies you may choose to have. Optional boat trip. This was the most perfect place to spend a quiet time catching up with myself. I really feel that the balance between pure relaxation and then a little exploration of the island was amazing for me. I came home feeling so ‘re-charged’ but also feeling that I had also had many enjoyable experiences and fun, like on a regular holiday. Thanks so much! I would love to come and do this again! 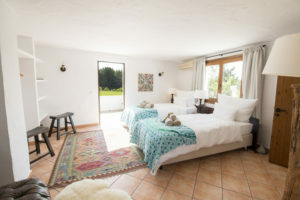 Our gorgeous ‘luxury bohemian’ finca in the peaceful countryside near Santa Eularia. A cool, spacious & tranquil villa within a private and fully-walled property; a gorgeous sanctuary where you can fully relax and take some time out for yourself, lounge by the pool or rest on a day bed in one of the many shaded spaces, and breathe…. We believe that yoga-off-the-mat is about enjoying all good things in moderation – and rewarding yourself (as this is your holiday) with a healthy treat or two too! 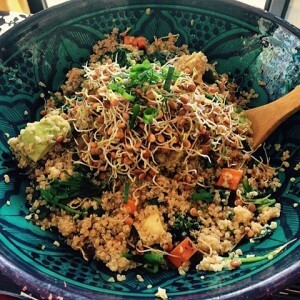 So sweet-toothed guests can be satiated with raw-vegan desserts and those wanting to experience the local grapes can opt, if desired, for a glass of delicious of organic wine with dinner. Email us to find out more, or speak to a lovely human voice.